To help recreate the feeling of actually playing at a live roulette table, some online casinos offer live dealer games as well as the standard video-game style versions. Although these games are a long way from completely recreating a live casino environment in your own home, it is a breath of fresh air for those that want to take a break from the standard games and shoot for something a little more realistic. Why Play With Live Dealers? The main benefit of playing at live dealer casinos is that some people will feel more comfortable with actually being able to see an actual roulette wheel being used for play. This is not to suggest that any of the non-live games are fixed in any way, but some may want to play with a real dealer and roulette wheel nonetheless. In addition to this, the live dealers help to make online roulette that little more personal, which is a step up from the standard games that can feel quite impersonal and cold at times. However, this is all just a matter of preference, and so some people will be content with the standard games whilst others will prefer to take advantage of the live dealer roulette games. The whole live dealer roulette tables work pretty much how you might expect them to work. Within the roulette window you have a smaller window that shows a live feed of a croupier (roulette dealer) and a real life roulette wheel. The croupier will set the wheel in motion at regular intervals and spin the ball around the outside of the wheel, just like at any land casino. The croupier will not wait for players to make their bets, and will simply start each round after around a minute. There is also a prominently placed tip box in the majority of the live dealer tables if you're feeling particularly generous, and you can always expect a nice 'thank you' in the chat box after sending some money the dealer's way. However, fortunately for some there is no obligation to give any tips whilst you play. The only drawbacks of playing with a live dealer are that the gameplay speed is slightly slower to allow for each player to make their bets, and the video feed can be a little choppy if you are using an older computer. Other than that, the game is pretty much just like any other standard online roulette table with the live croupier and wheel in place of the graphical one. 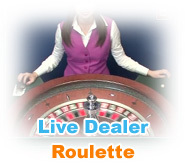 I think that live dealer casino games are a great alternative to the standard games on offer. Whilst I do not particularly mind playing at the normal roulette tables, it's nice to be able to play with a live dealer and roulette wheel online once in a while. The chat box can occasionally become a little seedy at times with the odd "you are very beautiful" and "do you have a boyfriend?" comments (the dealers are female 99% of the time), but this is just more entertaining than anything. So although I wouldn't always play with at a live dealer table, it's definitely nice to have the choice there. I feel that the live dealer casinos are definitely a solid option for players that are concerned with the fairness of the standard games more than anything, and so being able to see a physical roulette wheel and ball should help to put minds at ease.